Long before he ever donned his trademark mask, Wade Wilson was known by the name 'Jack.' Having lost his mother to cancer, he was raised by an abusive single father, which caused him to lash out often as a child, and he was labeld a delinquent. As soon as he was old enough to get away from his father, he enlisted in the US Army, but was soon kicked out, due to his mental instability. Using the skills he learned in the military, he sold his services around the globe, but refused to kill anyone he considered 'innocent'. He botched a mission, and was forced to go on the run and was injured in his escape, and nearly drowned. Still injured, he was rescued from drowning by a newlywed couple, Wade and Mercedes Wilson, who were unaware of his nature. Attempting to usurp Wade's identity, to hide from his former employers, the couple fought back and Mercedes was killed in the crossfire. At this point, he snapped, and believed himself to be Wade Wilson in truth. Soon after failing yet another mission, this time in the Middle East, he discovered he had cancer. Submitting himself to the Canadian government for what he thought were medical experiments to cure cancer, but was in truth a series of military experiments, he was genetically altered, the result being a superhuman healing factor, and his body fighting a constant war with itself, cancer cells and healthy cells in constant flux. He was labelled a failed experiment, and shunted off to a facility to hold others like him. When he arrived at the facility, he made friends with a man commonly known as Worm, but due to his constant pain from the cancer, he was suicidal. His plan for suicide was to mock the super-powered sadist(Whom he mocked by calling him Francis) who ran the facility until he was killed, but Francis did not give the man what he wanted, and instead lobotomized his friend, Worm, as revenge for the mocking. Discovering what had been done to him, Wade mercy-killed Worm, and, since Francis would not allow him to die, took revenge on him, killing him, and proclaimed that Wade Wilson was dead, and that I was now Deadpool. I left the facility behind, and continued my work as a mercenary, working as a mercenary again, and I also collected taxes for a local crime boss. I eventually returned to the Canadian government, to see if they could get my cure right this time.. The doctor tried to treat it, but he couldn't get rid of it. I did steal a nifty little teleportation device from him, though, so not a total loss. Deadpool sees things, hears things, and understands things that no one else does, leaning on or making references to the fourth wall(which rarely make sense to anyone else). While he's capable of making sense, he's also capable of confusing the hell out of just about anyone. Including players. No yellow boxes, but the yellow text is a nice stand in! Deadpool has a joke for just about every occasion, and is not hesitant at all to express them. His sense of humor varies from being sarcastic and sharp, to absurd, to utterly sadistic. For example, he likes to call guns Doorknobs,which has lead to some unusual conversations. Doorknobs don't kill people, I do! Deadpool suffers from this. Otherwise known as multiple personality disorder, it again makes him unpredictable, making this his greatest strength and weakness at the same time. This is a carry-over from when he would assume new identities early in his mercenary career, before taking up the mantle of Deadpool. Once he snapped, he no longer knew who he was.I'm schizophrenic and so am I! Deadpool is primarily driven to forget his past and 'enjoy the moment'. His past is not something he cares to think about and he spends a lot of time distracting himself and distancing himself from it, no matter how much it comes back to haunt him. Though his immediate goals often vary depending on his employer and state of mind, his deepest underlying goals are for atonement, death, and comfort. Deadpool has a superhuman healing factor that keeps him in peak physical condition, and is able to regenerate from any injury, as it's able to reconnect or regrow separated limbs, and has even survived injuries to his brain. Due to the fact that his cancer regenerates at the same rate as the rest of his body, he is covered in scarred tissue and tumors. This causes him constant pain, but due to living with it for years, he has adapted, giving him an extremely high threshold for pain. Due to his healing factor, Deadpool is resistant to most poisons and other drugs. For example, it is nearly impossible for him to get drunk, as the alcohol is filtered out of his bloodstream faster than he can imbibe it, and it takes 5 times the tranquilizer dosage it would take to knock out an elephant to knock him out. Deadpool's healing factor also extends to his immune system, ramping it into overdrive, so it quickly quenches any infectious diseases, rendering him immune to all the ones he knows of. Due to his healing factor preventing deterioration of his body through aging, it's unknown if, or even when, Deadpool will die, particularly of complications relating to old age. He will likely live a long life, whether or not he wants to. Deadpool carries a device that allows him to teleport himself out of(and occasionally into) trouble. It can teleport him and two others up to 10,000 miles. It works in two modes; waypoint teleportation, allowing him to teleport to a preset destination at a range, and for shorter-range hops, he can teleport in conjunction with a wrist-mounted laser set to a unique frequency for guidance. It has a self charging power-cell, which takes two days to charge if totally exhausted, and the amount of power drained from the cell is directly proportional to the distance he travels. So the total distance he can travel, on a full battery, is 10,250 miles. It is sometimes subject to malfunction, sending him to the wrong location, or failing entirely. It works more often than not, however. Deadpool has a wide variety of weapons available to him. He almost always has a pair of katanas on him, and handguns. Other equipment he has available include machine guns, grenades, rocket launchers, sai, knives, a rubber duck, and an inflatable sheep gun. Deadpool has a holographic device that lets him disguise his true appearance as necessary. It can be easily countered by anything that can see through the hologram, including physical touch. Deadpool is particularly skilled at battle banter, and can potentially disrupt an opponent's conversation. It was once said his mouth was one of his most lethal weapons, as he will blabber nonsense throughout a fight, distracting and maiming his opponent until they either give up or die. Deadpool knows several different martial arts, making him a formidable opponent, even unarmed. His unpredictable nature also leads him to be a more difficult opponent, subverting the expectations of people who try to read his fighting style. Deadpool is quite skilled with swords, knives, and other things you can use to smash or slice people with. As a mercenary, Deadpool has developed his skills as a sniper and crackshot with a wide range of firearms. With a proper rifle, he can hit a moving target at 900 meters away. Out of necessity due to his globe-trotting, Deadpool has learned a smattering of several languages, and is fluent in German, Spanish, and Japanese. Thanks partially to his healing factor, and partially due to extensive practice, Deadpool is a superb athlete. His healing factor keeps him in peak physical condition, and his years as a mercenary has given him excellent coordination. Strong and flexible, his martial arts training has given him a plethora of acrobatic skills, I'm like a modern ninja. Deadpool can drive anything with four wheels and a few things without. Deadpool isn't exactly the best pilot in the world. As the saying goes, any landing you can walk away from is a good one…. However, Deadpool's healing factor negates any value of the idiom. He can actually pilot a helicopter with reasonable facility. 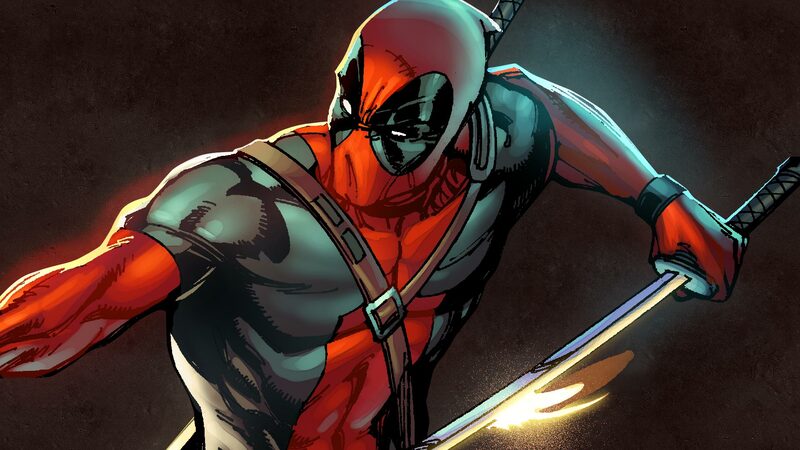 Partially a remnant of his military training, partially a skill acquired from his life as a mercenary, Deadpool has extensive knowledge of edible and poisonous plants, though he doesn't rely on it much due to his natural extreme resistance to poisonous plants. Deadpool's unpredictable nature causes him to confound and annoy others, allies and enemies alike, making difficult for anyone to team up with him, and almost invariably insuring that team-ups aren't repeated, and often, where some enemies might hold back, simply wanting to defeat their opponents, opponents facing Deadpool don't. Deadpool is more or less a walking arsenal of weapons. While one cannot take away his skills, they can take away his equipment, While he can still fight effectively unarmed, it would severely curtail his mobility and combat effectiveness at range if this were to happen. Deadpool's past is definitely shady, meaning people who know him by reputation are unlikely to trust him, and he has many enemies from his past come back to haunt him, which include surviving targets and former employers. Deadpool is FREAKING ugly, when he goes unmasked, his visage can easily inspire nausea and vomiting in all but the most jaded souls. Most people who see under the mask regret it.